Recent studies suggest bacteria in our digestive tract can play a large role in our overall health. Microbes traditionally get a bad press but less than a tiny fraction of the millions of species are harmful to us. Many are crucial to our health playing a role in a number of metabolic functions and keeping our immune system healthy. 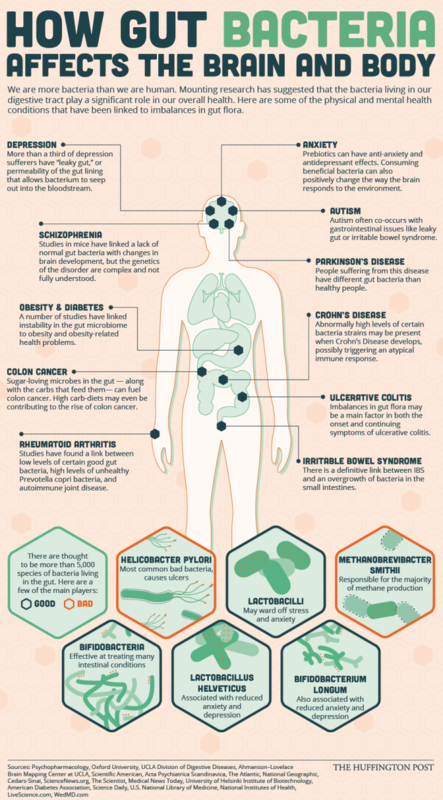 Depression, anxiety, autism, schizophrenia, obesity, cancer and irritable bowel syndrome are just a few of the major complications gut bacteria can create. With over 5,000 species of bacteria living in the gut, we have a mix of good and bad microbes. Helicobacter Pylori causes ulcers, while Lactobacilli may ward off stress and anxiety. Keeping a healthy digestive system is key to maintaining optimum health. For decades, nutritional supplements have helped people target different body systems; however, these solutions have not adequately addressed what is now understood to be at the core of overall health. Recent scientific discoveries have uncovered a fascinating ecosystem within each of us called the microbiome. This complex network of bacteria, fungi, and microflora reside primarily in the gut and impact the health of virtually every system in the human body. The microbiome accounts for 90% of the cells that create you, yet only 10% of the cells in your body contain your DNA. While the microbes living in your body are essential to survival, they can also be detrimental to your health. Some of the most striking research is on links between the microbiome and the brain – our whole mental and emotional wellbeing determined by our microbiome. Inflammation also starts in the glorious gut! Heart disease, diabetes, liver issues, joint pain, hormonal imbalances, obesity are all different ways we can experience inflammation. Unfortunately living in the modern world is not exactly friendly to our gut! However, the wonderful thing is that the microbiome is accessible and it can be modified. Three-fourths of the microbiome lives in your intestines, which is why our top scientists & doctors at Synergy Worldwide have designed innovative products to target the gut microbiome. Protecting and supporting good microbes is just as important as eliminating the bad ones. 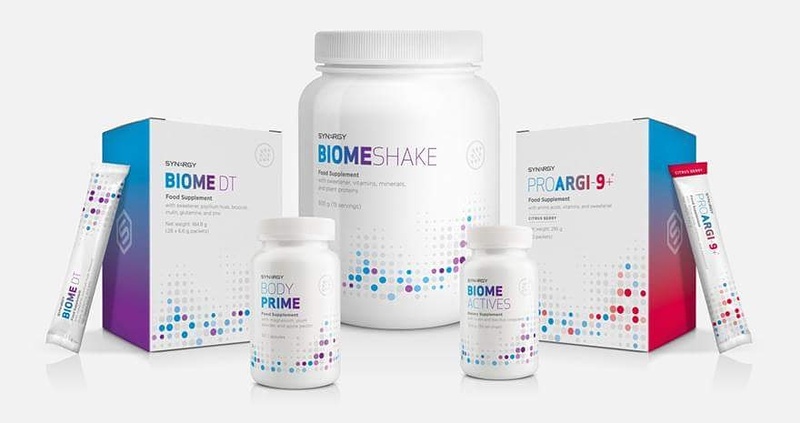 True to their ethos of science based, nutritional innovation, Synergy Worldwide have launched a first to market system worldwide of natural, botanical supplements that work holistically and synergistically together to detoxify your body, cleanse your digestive tract and re-balance your microbiome. Are you struggling with your health and wellbeing? Are you frustrated at the lack of help, advice and effective treatment available? Maybe you’re looking for a natural solution? It’s no secret that lifestyle, diet and agricultural practices have had a major impact on nutrition and consequently on global health over the last few decades. The result is that many of us are suffering from ongoing, uncomfortable and potentially very serious health conditions. Synergy have produced high quality, potent and pure nutritional products designed to tackle these issues. Backed by dedicated research and evidence, human clinical trials and with over 600 tests being performed on the products before they are sold – you know you are getting the best! The products are available to buy below, but for the best results contact me directly for a free consultation and on going guidance during your journey. If you’re looking for a home based business opportunity, you can make a great income and help people to achieve better health at the same time. Contact me to find out how. Synergy Worldwide was founded in 1999 with a vision to help others leave a legacy, based on the principles of integrity, quality and stability. Founder Dan Higginson chose the name Synergy, because it represents how by coming together, we’re stronger than as individuals. Dan’s ambitious aim was to have a company that helped “people everywhere attain better health, grow more prosperous, and support communities in need”. As a result, today, you’ll find Synergy Worldwide in over 28 countries and it continues to grow. The company prides itself on its ethical status and its scientifically validated work. Synergy Worldwide is owned by Nature’s Sunshine Products, the #1 supplement manufacturer in the world. ‘We are so confident in our products that there is a 90 day money back guarantee on all purchases’. 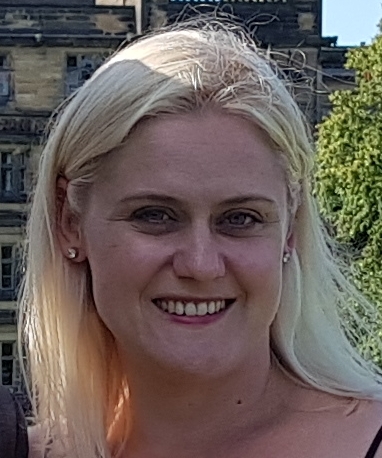 Hi my name is Anna, and I am a mother of two beautiful girls, dressage rider and owner of Beauty Inside Out. I am passionate about helping others to achieve better health. Having suffered with digestive issues for many years, I know how much Synergy products have improved my bodily functions. Knowing that what I am consuming is pure, potent and botanical is extremely important to me – I did not want to be on medication for the rest of my life, just covering up the symptoms. My belief is that no matter who you are, everyone one of us could become healthier.